A birthday party became a boating party, as rescue crews evacuated guests in a raft, in one of several water rescues on Saturday in the D.C. area. WASHINGTON — A birthday party became a boating party, as rescue crews evacuated guests in a raft, in one of several water rescues on Saturday in the D.C. area. Montgomery County’s Fire and Rescue Swift Water team, along with National Capital Region Park Police, evacuated some 20 people attending a 1-year-old child’s birthday party at Meadowbrook Park. They used a raft to get people out of the building, which was surrounded by water, at the intersection of Beach Drive and Leland Street. They were ushered onto a Ride On bus; there were no injuries, Montgomery County Fire and Rescue spokesman Pete Piringer said. Several people were trapped and rescued in the area of Brighton Dam Road and Bordly Drive. Piringer said that two vehicles, one occupied and the other unoccupied, were reported stranded in high water. The driver self-rescued and the person is being evaluated by emergency personnel. In the same area, crews rescued a person who was trapped and standing on the roof of a car. Brighton Dam Road between Georgia and New Hampshire avenues remains blocked by high water from the overflow of the Hawlings River as of 11 p.m., Piringer said. In Olney, Maryland, on Volunteer Drive and Olney Laytonsville Road, crews evaluated the driver of a vehicle that was stranded in high water. The area of Beach Drive in Montgomery County, between East West Highway on the D.C. border, was closed due to high water. Heavy rain overwhelmed storm drains, leading to standing high water on the Interstate 270 split, Cabin John Parkway and Clara Barton Parkway. 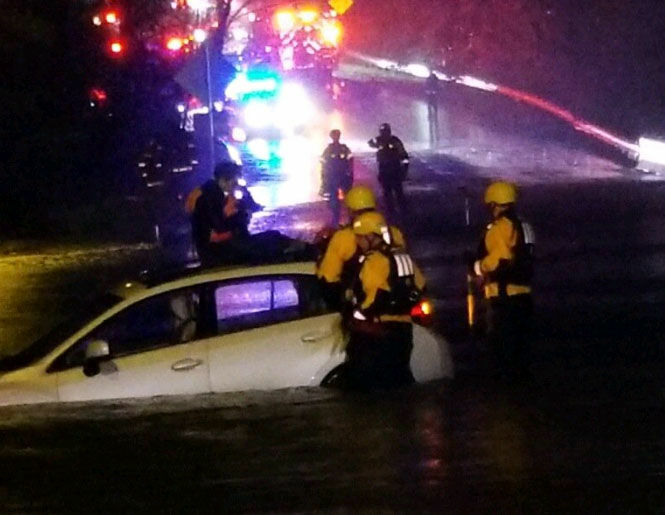 Rescue personnel helped a person stuck in floodwaters on Woodburn Road and Spicewood Drive in Annandale, Virginia. The road was closed overnight and opened around 3 a.m. on Sunday. Fairfax and Loudoun counties reported a number of road closures Saturday due to high water, and asked drivers to avoid these areas and find other routes. Loudoun County was under an areal flood warning — a flooding that develops more gradually and results in gradual ponding in low-lying and flood-prone area. Saturday’s downpour continued 2018’s trend as being one of the wettest years on record, especially in the fall. WTOP’s Zeke Hartner contributed to this report.